Address: 361603 Kabardino-Balkarskaya Republic, Elbrussky r-n, s. Elbrus, Lesnaya st., 2. National Park Prielbrusie, in the Tyrnauzsky and Zolsky Districts of the Republic of Kabardino-Balkaria, was founded in 1986. Its area is 101,4 thousand ha. It includes the highest part of the Great Caucasus and the Elbrus massif (5621 m and 5642 m above sea level), the northern slope of the "Watershed" ridge and the southern slope of the "Side" ridge, divided by the valley of the river Baksan. The relief is alpine. 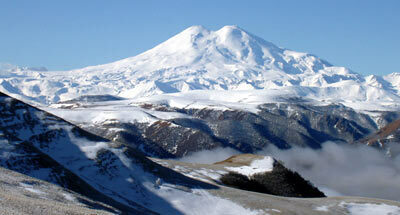 The top of Elbrus is covered by a glacial cap 122.3 square km wide. 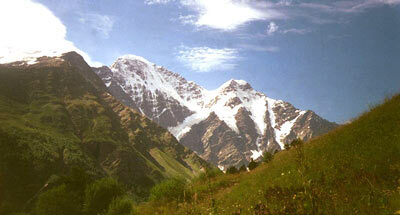 The largest glaciers are the Bolshoy and Maly Azau Tarabashi, Terskol, Shkhelda, and Dzhankaut. In the plant cover alpine and alpestrine meadows prevail; on the lower border of the Park is a belt of alpestrine bushes (Rhododendron caucasicum, Juniperus sabina, Salix arbuscula). In valleys and on the slopes between heights of 1400-2300 m pine forests grow; where snow avalanches occur birch forests grow. Along the left bank of the Baksan river there are sites of meadow-steppe and steppe communities with feather-grass, sagebrush, and Astragalus. Of rare and disappearing plants there are noted the Lilium kesselringianum, Orchis militaris, Orchis purpurea, Onosma polyphylla. Caucasian auroch and chamois are common. 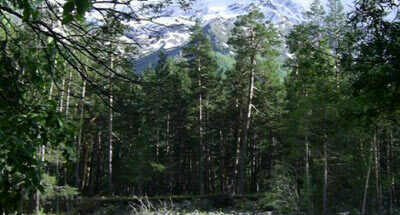 In the pine forests common marten, stone marten and squirrel live; along steppe and meadow sites souslik lives. In rhododendron thickets Lyrurus mlokosiewiczi are met — a species noted in the Red Data Book of the Russian Federation. In the alpestrine belt Tetraogallus caucasicus and alpine accentor are common.